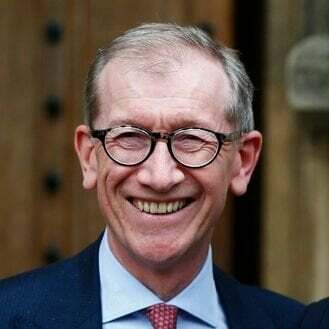 A Liverpool reader draws attention to the news that Philip May, husband of the UK prime minister, works for Capital Group, the largest shareholder in arms manufacturer, BAE Systems, whose share price has soared since the recent airstrikes in Syria. It is also the second-largest shareholder in Lockheed Martin – a US military arms firm that supplies weapons systems, aircraft and logistical support. Its shares have also rocketed since the missile strikes last week. Admiral Sir John Slater, the former first sea lord, left the military in 1998 and became a director and senior adviser to Lockheed Martin UK. Michael Portillo, the secretary of state for defence from 1995 to 1997, became non-executive director of BAE Systems in 2002 before stepping down in 2006. Lord Reid, secretary of state for defence from 2005 to 2006, said in 2008 that he had become group consultant to G4S, the security company that worked closely with the Ministry of Defence in Iraq. Air Chief Marshal Sir Glenn Torpy, the chief of staff from 2006-2009, retired from the RAF last year and will become senior military adviser to BAE Systems in January. Sir Kevin Tebbit, under-secretary at the MoD, became chairman of Finmeccanica UK, owner of Westland helicopters in 2007 and has a variety of other defence related appointments. Major-General Graham Binns left the military in 2010 and became chief executive of Aegis Defence Services, a leading security company. David Gould, the former chief operating officer of the MoD’s procurement division, became chairman of Selex Systems, part of Finmeccanica in 2010. Lady Taylor of Bolton was minister for defence equipment for a year until 2008 and became minister for international defence and security until Labour lost the general election in May.In 2010 she joined the arms contractor Thales, which is part of the consortium supplying two aircraft carriers that are £1.541bn over budget. In 2010 Geoff Hoon, the ex-Defence Secretary caught attempting to sell his services to fake lobbyists back alongside Stephen Byers. When he was an MP, military helicopter company AgustaWestland were awarded a billion-pound order. Now out of Parliament, Hoon earns his way as the company’s Vice-President of international business. Then Business Secretary Vince Cable was one of 40 MPs on the guest list for a £250-a-head gathering in 2015 at the Hilton hotel on Park Lane. he gave a speech at the event organised by trade organisation ADS, the trade body for UK Aerospace, Defence, Security and Space industries arms fair.. Ministers were wined-and-dined in 2015 by the arms trade at a £450-a-head banquet on Tuesday night just hours after parliament’s International Development Committee said the UK should suspend all arms sales to Saudi Arabia. Labour Minister Yvette Cooper’s dad was chair of nuclear lobbyists The Nuclear Industry Association. Ed Davey, Lib Dem energy minister’s brother worked for a nuclear lobbyist. When failed to be re-elected went to work for the same nuclear lobbying firm as his brother. Lord Clement Jones who was Nick Clegg’s General Election Party Treasurer was a nuclear industry lobbyist. Tory Peer Lady Maitland is board member of nuclear lobbyist Sovereign Strategy. Bernard Ingham, Mrs Thatcher’s press spokesperson, has been nuclear lobbyist for over 25 years. Lord Jenkin was a paid consultant to nuclear industry. MEP Giles Chichester is president of nuclear lobbyists EEF. A disturbing number of senior officials, military staff and ministers have passed through the ‘revolving door’ to join arms and security companies. This process has helped to create the current cosy relationship between the government and the arms trade – with politicians and civil servants often acting in the interests of companies, not the interests of the public. When these ‘revolvers’ leave public service for the arms trade, they take with them extensive contacts and privileged access. As current government decision-makers are willing to meet and listen to former Defence Ministers and ex-Generals, particularly if they used to work with them, this increases the arms trade’s already excessive influence over our government’s actions. On top of this, there is the risk that government decision-makers will be reluctant to displease arms companies as this could ruin their chances of landing a lucrative arms industry job in the future.